Bats are found almost everywhere in the world. In the United Kingdom there are over eighteen local species and, unlike many of their international counterparts, they exist solely on a diet of insects. These native mammals have declined considerably over the last century due to; loss of habitat with building and road developments, cats, pesticides, and chemical treatment of building materials. As a result of this extreme decline, bats are now a protected species. This protection also extends to cover their roosts. Although bats roost in many different places, they often make a home in domestic houses. The most common of bats, the Pipistrelle, is the one you are most likely to find in and around your home. They love tight spaces like behind barge boards or hanging tiles, and sometimes between window frames. Another bat to frequently make a bed in houses is the Long Eared Bat. They love to make their homes in the gap below the roof apex. Bats live quite sociably beside humans. They are generally clean animals and normally the only sign of their inhabiting a house are their droppings which, if cleared away regularly, cause no health issues. Around mating times males can become territorial, but otherwise they are quite passive. However, there are times when you may need to look at having a bat or bats removed. If a bat invades your living space, if you are carrying out renovations and find a bat roost, or if you are restoring an old building that contains bats, then you will need to talk to an expert about whether the bats are able to be removed, and the best way to go about it. 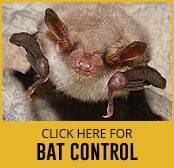 If you are looking at removing bats then this is a time when you really need to talk to a pest control specialist. Bats and their habitats are protected, and it is against the law to just remove a bat from where it is roosting without following the proper legal channels to gain permission. It is also against the law to capture, kill, disturb or even injure a bat, even if it is by mistake. A pest control specialist can take you through the legal process, and follow up by removing the bat and relocating its roost to a new environment. If you have bats in the belfry and you need them to move them, contact our pest control specialists. They will ensure both yours and the bats’ homes are protected.